I've only recently discovered Rebecca Johnson's nonfiction, but I'm already definitely a fan. Most recently I reviewed When Lunch Fights Back and today I'm looking at another unique look at animal life. The introduction shows a beautiful swallow with a surprise - it's radioactive. How could this happen to an animal? Well...the first chapter explains the history of the nuclear disaster at Chernobyl, explaining both the scientific and historical context. The chapter ends with a section on the long-term effect on humans in the dead zone and the creation of the Exclusion Zone around the disaster. The next three chapters condense an extremely complicated situation, a number of species and their different reactions to the radioactive sector, and the differing opinions and theories of two groups of scientists into an admirably concise and fascinating narrative. Are animals really thriving in the dead zone? Is the radioactive area changing them for the better or worse? Can radioactive sites be reclaimed? 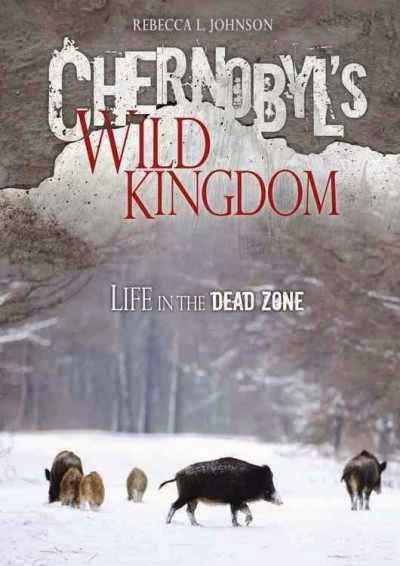 The final chapter reflects on the lessons learned from studying Chernobyl, the part nuclear disasters continue to play in our lives, and the resilience of the animals who continue to live in these areas. Back matter includes an author's note (primarily acknowledgements), glossary, source notes, bibliography, further information (books, websites, and videos), and index. The book is an over-sized chapter book style, which I am very happy with since it is so difficult to get older kids to check out nonfiction that looks like picture books. It's a concise 64 pages, but packs a ton of text, photographs, sidebars, and additional information into those few pages. Verdict: This is a well-written book an a unique and interesting subject. But, it's from Lerner's Twenty-First Century Books imprint which means it's OMG EXPENSIVE. It's really, really hard to justify spending $27 on a book. It's not something timeless like Lego building either, where it makes sense to shell out extra $$ for a strong binding. This is an ongoing research project into the effect of nuclear disasters and there will undoubtedly be new titles on this subject coming out a few years down the road. So, if your budget can cover it, highly recommended. If, like me, you have a smaller budget, sigh sadly as you take it off the order cart. ISBN: 9781467711548; Published 2014 by Twenty-First Century Books/Lerner; Borrowed from another library in my consortium (with a bigger budget); Still holding on a backlist of ordering because I really, really loved it, but will probably not purchase. This week at the library; or, Why is hibernation not a thing? One more week until Spring Break and vacation! For me anyways...cold. COLD. However, I did hear some really nice things from a teacher I work with and a parent said something really nice which I meant to write down but promptly forgot. But warm fuzzies! Monday - lengthy staff meeting, then I had a second, unofficial staff meeting with my staff to plan out displays and pass on all the stuff from the staff meeting, then I gave the information desk a break, then I worked on stuff from the staff meeting (although not actually writing up the staff meeting minutes) while I was on the information desk in the evening. And I was the Easter Bunny for Tiny Tots. Tuesday I got to be the Easter Bunny again - twice - for the toddlers, processed new books, wrote up the staff minutes, sent out copious emails regarding outreach, and tackled the missing list. It was a rather...well...things happened and I am dealing with them. Wednesday - I worked through another cartful of easy readers and a bunch of other things. Nobody really showed up for storytime. Then I cleaned off my desk and went over the big projects my associate is going to do next week while I'm gone. Thursday. still cold. so....cold....I....did stuff. Cleaned off my desk, worked at the information desk, and then egg painting. Friday - I cleaned off my desk and my cart and finished going through the easy readers through the Rs and made a calendar for the Storyroom outside/evening events (like the Brownies meeting there) and then t-shirts. Aladdin - my one copy of this has checked out over 300 times. I've seen previews that it's being released again, but no definite dates. Lilo and Stitch 2 - the soundtrack. Very unavailable, but I was able to figure out the song they wanted was on that soundtrack. a little girl picked Tokyo Mew Mew and her dad was like "what IS this?" I figured out she just wanted something pretty and gave her Tinkerbell comics instead, which would be easier to read. Sometimes you just need something light and British. Digby O'Day loves his car, even if it is a bit old and prone to mishaps. One day, he and his best friend Percy are out for a drive when a particularly bad mishap nearly lands them in the soup! Fortunately, a helpful family saves the day (unlike that nasty Lou Ella in her bright pink convertible). Shortly afterwards, a big race is announced and Digby is excited to enter. However, things go wrong quite soon and he finds himself trailing behind everyone. Does he have a chance to win? And will he take winning over helping out his friends? The artwork is most of the appeal of this sweet but rather meandering story. It has a breezy 50s feeling with the butlerine Digby, fashion-plate Lou Ella, and sleek, cheerful cars. The illustrations are in shades of black and brown, highlighted with red and pink. This is a very slight story, very British with its cozy characters and bits of slang, and it is rather meandering. Just like Digby O'Day's race. But it's rather relaxing all the same. I enjoyed reading the cute little character bios, and the simple message that nice guys don't necessarily finish last, while very pat, is comforting and makes for a satisfying ending. This also includes character bios, quizzes, fun writing and drawing prompts, and is the first in a new series. Verdict: This is a perfect book to hand to really young, strong readers. They need something more challenging than easy readers, but they're not really developmentally ready to handle the plots of the more usual beginning chapter series. It would also make an adorable read-aloud for preschoolers. I have a really hard time accepting the new incarnation of Amelia Bedelia as a child. I've always felt that a large part of the humor of her literalism disappears when she's a child, since kids make mistakes about words quite often normally. If I was going to like one, however, it would probably be this one. 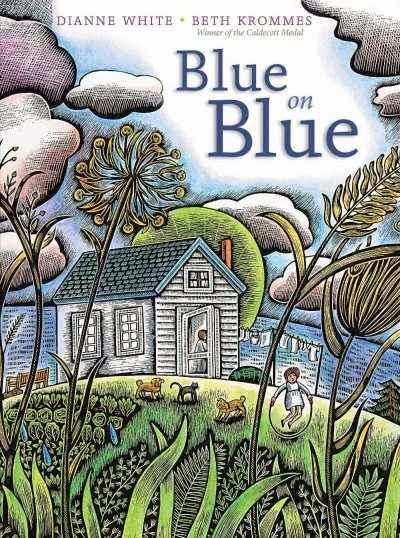 On a glum winter day, Amelia's mother says, sadly, that she is feeling blue. Amelia is confused, but suggests her mother has a playdate to cheer herself up. Her mom agrees and their neighbor comes over to watch Amelia and her friend Rose while Amelia's mother goes out. 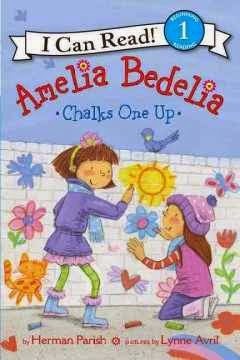 As she leaves, she says "chalk up another gray day" which gives Amelia an idea. With the help of her friend Rose and a growing crowd of passers-by, they create a beautiful explosion of colors with all her mother's favorite things. There wasn't as much of the mistaken words theme in this one, which is part of the reason I liked it. I Can Read's level ones have quite a significant amount of text, compared to other publishers, and this flows smoothly and would be quite good for the average first grade reader. What really sells this for me is the lovely illustrations. They fit nicely in amongst the text, without distracting from the words, and are full of friendly color and light, starting with the dull gray winter day and then blooming into an explosion of color. Verdict: This is similar enough to the Fancy Nancy easy readers that you can just go with those, if your budget is limited, but if you have the money this would make a nice additional purchase. Especially if you live somewhere with lots of gray winter days! I put my name in for this title at Lerner's Free Book Friday because it looked interesting and I always want more books that will get kids outdoors and interested in nature (which, when you think about how much I dislike going outdoors is kind of ironic). When the book arrived, I first realized that I actually knew the author's work - she did The Long, Long Journey which is amazing. And when I read the book I realized that it was amazing and I can't wait to use it in storytime! 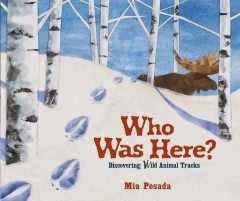 Each page has a rhyming narrative of clues and then the repeated question, "Who was here?" The following spread reveals the answer and gives a brief paragraph of information about the animal. Animals include a bear, wolf and moose, kangaroo, hippo and egret, beaver, camel and snake, and jaguar. There is a page of information on how you can learn to read tracks yourself, a couple websites, and four books suitable for the same age range as this one for further reading. The clues and answers are simple enough to read with preschoolers, while the additional information will be great for discussions with kindergarten and slightly older children. Posada's illustrations are reminiscent of Steve Jenkins' colorful ripped paper collages, but have richer backgrounds and a more realistic, natural look in my opinion. I especially liked that the text was carefully colored to stand out from the background, changing from light to dark as the background changes. The clue pages show not only the footprints in the mud, sand, or other ground but also a sampling of foliage around them. The solution page shows the animal in a typical activity with the background expanded to include more of its habitat. Verdict: This is the perfect book for science-based storytimes at any time of the year and I look forward to using it with my outreach visits. Highly recommended. This week at the library; or, Is it spring at last? Yes, it's spring, even though it's still freezing. The ways I can tell it's spring: I'm sick. The middle schoolers are bouncing off the walls. My car needs new brakes. I was doing really well keeping my dishes done (a New Year's resolution) and then got derailed and now there are dishes in my sink that date back to the Dr. Seuss party. I had a sudden urge to spring clean and cleaned out a lot of junk in my summer reading closet and office - mostly by dumping it on Jess. I forgot again to check the count so I'm still not sure how many people came to the art show - 50? 100? probably something around there. I should have worked a half day on Friday, but I stayed home miserably sick. I did do the dishes though...Saturday was busy but I made it through. The week did not end well, but I am trying to focus on the positive. 2 people asked for Where's Waldo and both times they were all checked out. I have a backlist of illustrators to choose from for my We Explore Favorite Artists programs and Beth Krommes was near the top of the newer illustrators I wanted to try. However, when I was picking people for this year's programs, I was worried that she didn't have enough of a backlist of titles, especially those I could use with toddlers and young preschoolers. However, with this new title, I need worry no longer. White's poetic text takes the reader through a rainy day on the farm, from growing storm clouds to pouring rain, from a celebration of muddy delights to the peaceful bath and bedtime as night arrives. Simple couplets explore the sound of the rain and the storm. Krommes' artwork is a visual feast, with so much to offer for a discussion in programming. Her distinctive scratch-art style, of course, makes scratch-art projects a must. Hidden details in the pictures; the girl and dog under the covers during the thunder, little ducks in a pond almost hiding in the gutter of the book, and details in the landscape views are perfect for a toddler audience to interact with the story. For older children, discussions of how Krommes uses her scratch-art style to create shadows and movement, light and dark in the images, will flow naturally from the story. I had our We Explore Favorite Artist Beth Krommes session last week and this book was a big hit. It's already garnered starred reviews and I expect to see it show up on award lists at some point as well. Verdict: Even if you're not planning a program around this book, it's a must-have to add to your titles for toddlers. Beautiful art and lovely text combine to offer a simple, reassuring story of the beauty of a summer storm. Highly recommended. I was skeptical when, several years ago, I first encountered Eaton's deadpan stories with their lumpy, broadly drawn illustrations. I quickly became a fan, however, especially when I saw how much kids giggled over them. When his graphic novel series, Beaver Brothers came out, I was hooked. So I was quite thrilled to see that he's back with a new easy reader series. It would be easy to call these "the new Elephant and Piggie" and compare them to Willems, but they're a completely different animal. Heh. The book opens with bright yellow endpapers, patterned with a stick, leaves, stone, turtle, acorn, and cattail. 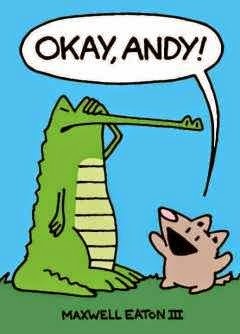 The title page gives the reader the first hint that Andy and Preston's relationship isn't the typical odd fellow friendship, showing the alligator holding the....let's call him a groundhog...up to his mouth. The first chapter, "Rabbit Games", introduces Andy (the alligator) and Preston (the other one). Andy is dreaming of a tasty rabbit dish, when Preston shows up, ready to play with his best friend! They're playing with a rabbit! So much fun! Andy, resigned to the situation, decides that Preston might as well be useful, but the game doesn't end up the way he expects! In chapter two, "Okay Andy" Preston is cheerfully collecting things to add to his acorn and keeps asking Andy if it's okay for him to have them. When Andy loses his footing, his stick, and his temper, will things be okay? Maybe, maybe not. The third and last chapter, "ZZZ" hints that Preston just might not be the friendly but clueless type. Andy just wants to sleep, but Preston wants to play a guessing game! This is the funniest chapter and kids will giggle helplessly as the exhausted Andy guesses all the wrong things for Preston's sound...and they both get a big surprise! Maxwell Eaton's art has a distinctive, handmade style with big blocks of color and thick, hand-drawn lines. You might expect the dot eyes and lines to create characters that lack expression, but they are wonderfully expressive. Andy's exasperated friendship, Preston's enthusiasm, and Eaton's deadpan humor shine through every part of the art. The text is simple, in some chapters consisted of only a few words, but this is one that will build children's visual as well as textual literacy, encouraging them to look for clues in the pictures, combine those with the text, and figure out what's going on beyond just the surface of the text. They will also be encouraged to read facial and physical expressions. Verdict: No surprise that this was the 2014 Cybils winner! Funny and a great mix of text and art, perfect for a beginning reader with a little experience. Highly recommended. A few years ago I went to a museum exhibit of Impressionist art, with the fashion of the time period to accompany it. It was amazing, but I drove my friends nuts. While they were oohing and aahing over the amazing clothes, I was wondering how long servants had to spend ironing those millions of pleats. So, when Sarah Albee first announced that she was writing a book on fashion, I knew I was going to love it. She has a genius for looking into the small, practical aspects of history and relating them to the bigger events. 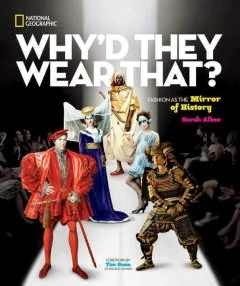 The book opens with a foreword by Tim Gunn and an introduction by Sarah Albee, explaining how the book is arranged and a general overview of how fashion and history are intertwined. The main body of the book is divided into time periods, beginning with "The Ancient World", which includes Egyptian fashion, silk, Celts, and how fashion affected the Roman world. "The Middle Ages" focuses on Europe and the cost and expense of clothing, but also talks about how the Crusades affected European industry and includes snippets of information about Japanese styles. "The Age of Exploration" expands fashion across the globe, including dyes and their effect on the economy. "The Renaissance" focuses on the extravagant European styles, including poisonous make up (which isn't as historical as you might think!). "The Age of Reason" contrasts the clothing styles of the wealthy versus the poor, what colonists wore and how it related to the beginnings of revolution and how clothes were (or weren't) laundered. "Revolutionary Times" explains the importance of beaver pelts in the colonial economy and the growing use of cotton and its effect on the politics and economy of India and the American colonies. "Marching Toward Modernity" covers the mid-1700s to the early 1900s and includes a wide range of information about changes in children's fashions, military fashions, and the growing importance of the cotton and textile industry. "The Industrial Revolution" takes this information and digs deeper, talking about the rapid changes in the world that were affected by the fashion industry and in turn made major changes in fashion from more freedom for women's clothing to labor conditions in sweatshops. There's also a fascinating section on how the discovery of synthetic dyes made a drastic change in clothing styles and their economic and class significance. There are also sections on swimwear, athletic wear, fads in women's hats that affected wildlife, and more. The final chapter "World at War" takes readers through the radical changes in the world during the two world wars and the how the political and economic changes were reflected in clothing. Final sections encourage thinking about how our clothing choices today reflect our world, from mass-produced clothing in third-world countries to wearing fur. Back matter includes a time line, final notes from the author, bibliography, further reading and resources, index, and credits for the extensive illustrations and photographs that fill the book. Sarah Albee's great skill is in making history come alive and showing how the sometimes distant and unreal events like wars and politics, affected everyday people; not to mention how everyday people and events affected larger events. Of course kids have always wondered exactly how you went to the bathroom in one of those giant hoop skirts or how a knight in armor went to the bathroom (the answer...well, would you stop in the middle of battle to take all your armor off so you could go....)- but did they ever stop to think about how people fastened their clothes with no buttons, zippers or Velcro? Or how the cotton they might see growing in the fields or wear every day had a major effect on world events? It might even start some kids thinking about where their clothes come from and how they can make more informed choices. Verdict: Copious photographs and a constant stream of interesting, weird, and gross facts will keep kids' interest, even if they aren't history or fashion fans, and by the end of the book they'll not only be amused, they'll also have learned some subtle lessons about how the small choices we make affect the world around us. Highly recommended. Well, flu. A large number of kids, selected teachers, and my own Pattie are down. I am feeling a bit queasy myself. Have I not been sick enough this winter?? Possibly not. I subbed for Pattie's storytimes Tuesday morning, using Jess's storytime from Monday night. Yay! No planning required! I also went home early on Wednesday, after all the extra hours I put in last week. This was the week of unexpected outreach. Another cub scout troop showed up Monday night (although they didn't need a tour) and our special education school called on Tuesday to ask if they could come Wednesday for a tour. And this is why having a second person is awesome! I have a backup plan for this school (which works as long as they bring kids at roughly the same developmental stage). Then I spent two hours at Walmart and running errands on Thursday. All told I did 10 programs this week. I'm so tired...but I'm excited that I'm getting summer outreach with the schools set up already! Take Home Storytime: Let's Eat! I just love the Hilda stories. That doesn't keep me from taking forever to read them. I am a little embarrassed to admit how long I had this one out from the library. So I'm not going to say. The stories are never what you expect and I'm always surprised, amazed, and in love all over again. Hilda still misses the wild hills but she's cautiously excited when her mother encourages her to join the Sparrow Scouts. But things are quickly complicated by the appearance of a Nisse, a house spirit, and Hilda's inability to stop helping him despite the catastrophes that follow in his wake. Then there's her mother's eagerness to see her do well at Scouts and Hilda's nagging misery that everyone but her is getting badges. What's even worse, is that there's a dangerous black hound on the loose - is it something supernatural or just her imagination? Pearson's art, as Hilda has moved from the wild moors to the town, has become appropriately more focused on the people she now interacts with and the tighter, more civilized environs of the town, rather than the more abstract landscapes of the hills and mountains. 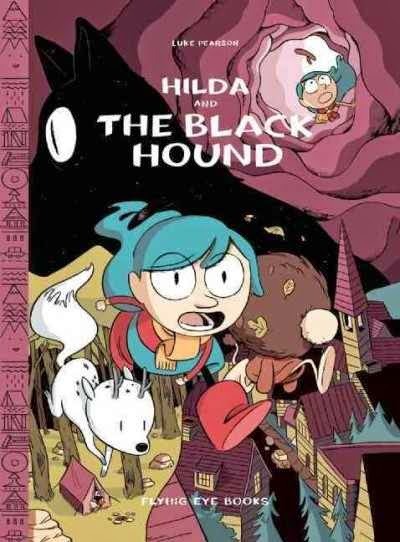 Hilda's emotions have become more complex as well and that's reflected in her facial expressions and those of the kids and adults she tries to relate to. Of course, there are also a lot of Nisses with full-facial hair in this story, so not so much expression there. It's a magical blend of cute and mysterious that never fails to delight. Verdict: I keep thinking that these are so different kids won't be interested in them, but I'm proved wrong again and again. If your library doesn't own any, try the first volume and see what happens! I've never reviewed a picture book in Small Readers, which is my series for easy readers. But when I read this through, the first thing I thought was Geisel. Absolutely, Geisel all the way. There are fifteen words and they tell a sweet and simple story, with plenty of humor. 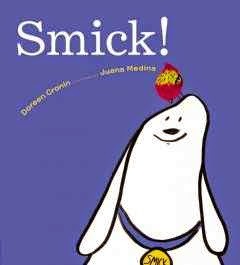 The main word, of course, is "Smick" the name of the dog. An unseen narrator gives Smick instructions, "Sit, Smick." When things go wrong, they add commentary, "Oh, Smick, oh!" I hadn't heard of Medina before; I think this is her first children's book in the US, although there are images on her website that imply a lot of other books I wasn't able to find any other titles. Anyways. She has a loose, cartoon style that was a great counterpoint to Cronin's repetitive, limited text. With spare charcoal lines, lit up by a blue collar and gold tag, Smick sits, jumps, runs and leaps across the page. The second character, Chick, is one of the two other items that appear - the other being a photograph of a stick. Chick's body is a flower petal with a speckled yellow center and red edges. The illustrations spread across pages with generous white space, leaving nothing to distract from the simple story. The font is extra large and bold, perfect for the earliest beginning reader or to share with a baby. Verdict: This is one of those books that shows that simple can be best. 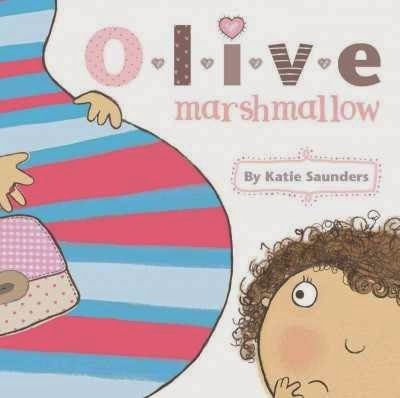 A great choice for a beginning reader, to read aloud to a baby, or to share in storytime. Highly recommended. 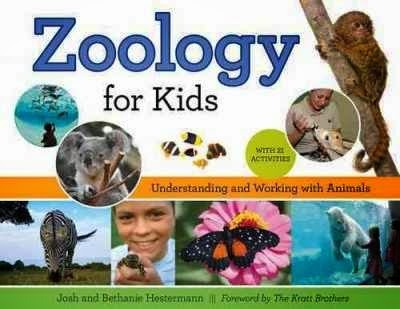 Kids who are fascinated with animals will love this introduction to zoologists which, as the subtitle says, covers both "Understanding and Working with Animals." The book opens with an introduction from the Kratt brothers and the co-authors, followed by a timeline of somewhat random events, from the opening of zoos to the contributions of people in the field. The main text of the book starts with a brief introduction defining zoology, then jumps into the first chapter that defines animals. Readers are warned that this is a little dense, and it is challenging, discussing cells, species, types of animals, and various special skills like echolocation. The next chapter explains animal behavior; life cycles, communication, and more. The third chapter explains how animals relate to and are intertwined with their environments, the concept of biomes, neighborhoods, and food chains. This is the first part of the book. The second part of the book is much less dry with lots of stories and real-life anecdotes about animals and the zoologists who work with them. There are chapters on zookeepers, veterinarians, wildlife researchers, and conservationists. Each chapter explains in detail what the jobs entail, including education requirements, typical daily life on the job, and interviews with real zoologists and scientists. Each chapter ends with talking about the different careers available in the field and the best preparation for them. I appreciated that they included all the many different support positions, like groundskeepers and receptionists, that are included in the field. Back matter includes acknowledgements, a detailed glossary, resources (various organizations), selected bibliography, and index. Hands-on projects are included in each chapter, ranging from creating your own species survival game (yes, this is a little morbid) to performing your own backyard animal research to playing an echolocation game. Additional information is included in charts and offset paragraphs throughout the book. This isn't a book for a casual browser or a struggling reader. The text is fairly dense and the vocabulary challenging. The authors are honest about the difficulties and competition you will face in trying for a career as a zoologist. However, it's well-written, informative, and provides a wealth of information in an attractive format. Verdict: Motivated animal lovers will devour this book, especially if they're serious about pursuing a career as a zoologist. Teachers will appreciate the variety of hands-on projects, which are suitable for a wide range of ages and abilities, and will want to use this as a resource. Although this won't have the high circulation numbers of, say, a National Geographic factoid book, it's a needed purchase for any library looking to balance their animal collection with some challenging, thorough resource materials. I still have a cold. I think I am allergic to winter. Busy, busy, busy. Planning, meetings, programs, reports, and so forth. Friday afternoon I just ignored all the other things I have to do and cleaned out the YA magazines. Phew, that felt good! Adventure books to read aloud to a 5th, 7th, and 8th grader on a car trip. I suggested Ranger's Apprentice and....another book I can't remember now. Guys Read Thriller maybe? The classic new baby formula gets a fresh and funny new look in this new title. Archie lives in a blue boy world - his pajamas are blue, his toys are blue, and he loves "planes, robots, and football." But something is changing...Mommy's tummy has gotten big and her office is...pink! Archie is a little worried about all these "fluffy, frilly, very pink things" and then he finds out there's a baby in Mommy's tummy! Then Mommy goes to the hospital and comes back with the new baby (and the promised surprise for Archie). New baby Olive looks just like a marshmallow but Archie is more interested in his new tractor. But maybe those pink toys aren't so bad after all...and neither is Olive Marshmallow. Soon Archie and Olive are best friends...just in time for another surprise! The quirky illustrations show an adorably curly-haired and stereotypical little boy who gradually warms up to the idea of a little sister, finally ending up with both of them romping through the playroom in pink wings and fairy crowns. The art style is a kind of modified Lauren Child, with soft colors and interesting patterns and shapes. There are a couple odd notes - I find it hard to believe that the parents wouldn't tell Archie about the new sibling until his mom was, as can be seen in the picture, very close to giving birth. The ultrasound picture shows a cartoon baby with rosy cheeks, smiling in her sleep. Any child who sees an actual ultrasound is going to be in for a bit of a surprise! The final part of the story zips Olive from infant to toddler with surprising speed and although she looks like a mature toddler or young preschooler, it says that "Olive doesn't have much to say yet" so kids may be disappointed that their own infant siblings take a little longer to get to the point where they can play together. Verdict: Although I do have some quibbles with the plotting of the story, it's a fun take on the new sibling theme and although I'd rather have seen Archie have a bit more of a toy variety at the beginning it was nice to see them all blended together at the end, as he realizes that Olive's toys are as fun as his own. A fun additional purchase if you're looking to expand your selection of new sibling purchases. I look forward to more titles from this new publisher. 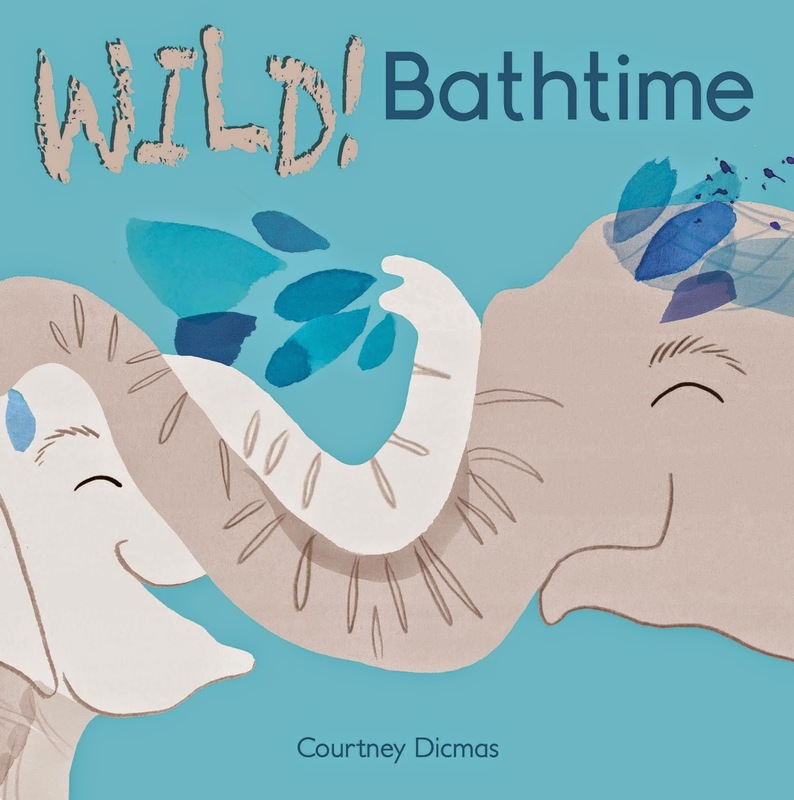 To be completely honest, I haven't felt very enthused about the picture books I've seen from Courtney Dicmas. I haven't been able to really get into her art style. However, when I got this new set of board books she has written and illustrated I had a very different reaction. I think her art is really suited to this medium - the bigger picture books seem to have a lot of white space and make her art too minimalist, fading into the background. Wild! shows animals in four different daily activities; at play, eating, taking baths, and at bedtime. Wild! Bathtime has a simple rhyming text but paired with the wacky pictures is hilariously funny. When it says "Let's scrub our hands, and our faces," we see a mother cat and kitten washing their faces with tongue and paws and when it continues onto the next page, "And all those other...hard to reach places!" there's a troop of monkeys picking at each other's fur. Wild! Mealtime shows another set of funny animal couples, parent and child, at mealtime. The mother snail has veggies for her baby, while the mother chipmunk warns her baby, with bulging cheek pouches, "Just take it slow." It ends with a naughty raccoon baby who's been hiding his peas - or so he thinks! A series of playful animals are featured in Wild! Playtime from zooming otters to the harried father lion on the front page. Several of the animals are linked to natural behavior in the wild like dancing cranes and hopping kangaroos. Wild! Bedtime is, I think, the funniest and features some of the more unusual animals. A perky little bunny shows up with her "teddy" to her mother's horror - it's a real bear! A flock of cygnets settles in on a swan's back, and "Kiss you, and turn out the light." is matched with an anglerfish, complete with glowing light. Dicmas' art shows animals and backgrounds created with loose shapes in pastel hues. Additional details are added in a bright rainbow of colors. Some color schemes are similar to natural coloring, like the gray elephants and pink piglets, while others show a vibrant imagination, like the pink and purple cats with rainbow whiskers. In a few of the pictures the loose art style makes the activity unclear; from an adult perspective, I know the foxes are diving into the snow (to hunt mice probably) but the minimalist art won't make that clear to a child. However, most of the pictures work quite well for an older toddler and parents will appreciate the added humor of the pop-eyed animal parents trying to survive their offspring's shenanigans. The rhyming text isn't always perfect and there seem to be a lot of unnecessary commas, but since the primary draw of a board book is the art, especially for the younger toddlers, that's not a major issue. The books are a nice, sturdy square, about 7x7 inches, 7 pages each. Verdict: This is a fun series with cute illustrations and generally acceptable text. Recommended as an additional purchase if you're looking to add to your board book collection. Board books are a major part of my circulation and collection and I would happily add them. I've really liked the other work that Loree Griffin Burns has done; Hive Detectives and Handle with Care. However, this fell short of my expectations. The narrative opens with the emotional discovery of two teens boys that a wide swathe of trees has been cut. Why? They were infested with Asian longhorned beetles. The first chapter describes the beetle and its life cycle, which destroys trees. "To save trees, we have to kill the beetle, but to eliminate the beetle, we have to kill a lot of trees." The next chapter explains how the beetle came to infest the US and the history of the six infestations that have been found - so far. Clint McFarland and Mike Bohne are part of the team of scientists and foresters trying to stop the infestation and the following chapter moves into their current efforts to eradicate the most recent beetle infestation in Worcester, MA. Unfortunately, it wasn't just the town that was infested - the beetles had moved to a small, wild forest nearby. The final chapter discuses the effects of tree cutting and the continued spread of the beetle and re-posits the original question "Was cutting those trees the right thing to do?" 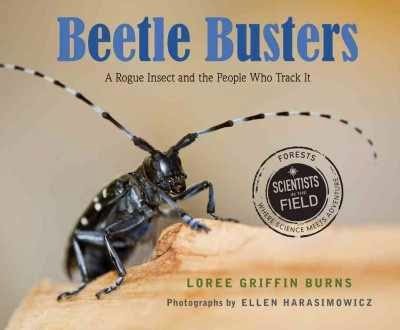 An author's note explains that Loree Griffin Burns experienced the beetle infestation in her town and this book grew out of her experiences with how the beetles were handled. She doesn't entirely agree with Clint McFarland on his solutions for the ALB infestation, but supports continuing dialogue and research into the problem. Back matter includes sources to learn more, including books, movies, and websites, glossary, bibliography, acknowledgements, and index. This departs from the usual model of the Scientists in the Field because it doesn't really focus on any of the characters involved and I think that's why I felt so disconnected from the story. The sources say that the book is primarily based on interviews conducted by the author over the course of three years with additional research, but I didn't get the feeling of seeing into the lives and passions of the scientists. Although this is obviously a very personal issue for the author, she didn't explain her own involvement until that final author's note and this left the whole book feeling very impersonal. Verdict: I really wanted to like this one, but I just couldn't connect with it. The older Scientists in the Field title, Science Warriors is still a better choice in my opinion. If your budget is large enough, or if invasive species is a topic of interest to your patrons, you could have both, but if you can only have one go with Science Warriors.